Instead of spending time in the days just before Christmas pondering what to put on her Santa wish list, one 10-year-old girl from Greater Boston was thinking of the thousands of her peers who are not as fortunate as she and took time instead to write a letter to Globe Santa. "My mom read a letter to me about how many people could not afford presents this year," the girl explained in her handwritten note to Globe Santa. As a result, she said in her letter, "I felt so horrible about it, I donated all of my saved up allowance money" to the Globe Santa Fund. The girl's letter is filled with the true spirit of Christmas as she says that she thinks not of what she can buy with her allowance money, but whom she can help. With her letter, the little girl enclosed the donation and went on to write that her younger brother also chipped in. "I hope this money will help someone have a better Christmas this year," she added. That letter is one of countless others from Globe Santa's friends who contribute to his mission each year to ensure that no parent or guardian who writes to him for help in providing their children with Christmas gifts is forgotten. Last year, Globe Santa's friends donated $1,100,356.40 while he and his helpers delivered presents to 54,077 children throughout eastern Massachusetts who would otherwise have awakened on Christmas morning and found no gifts to open. 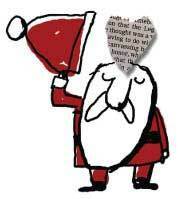 Globe Santa receives thousands of letters each year telling stories of families facing hard times and children who would miss out on the magic of Christmas without his help. But mixed among those heartbreaking letters are other letters that fill his heart with joy. Most of Globe Santa's friends mail just a check, but others add a note, like that of the 10-year-old girl, to explain their personal reasons for contributing to the Santa Fund. "Growing up my father tried to instill in me the spirit of generosity," wrote a woman from the South Shore. "Each Christmas he . . . sent a check from the two of us to Globe Santa. My father passed away in November. Before he passed, he made out a check to Globe Santa. Although this is our last donation together, I will always have fond memories of my dad and Globe Santa." And while some of Globe Santa's friends have contributed to his cause for years, others are making their first donation this year due to unexpected circumstances. "Every year, our family has a Christmas grab," wrote another family from the South Shore. "However, this year . . . it was decided to forgo the grab. I was very disappointed at first, but then decided to send the money we would have spent on the grab to Globe Santa." As Globe Santa begins to deliver gifts for the 51st consecutive Christmas, he said he expects this year to bring joy to more than another 50,000 children. But the happiness Globe Santa brings to those children each holiday season is not possible without the generosity of his friends. To become one of Globe Santa's friends and help him provide presents to families in need, please consider donating by mail or online at globesanta.org. Helping needy families share the spirit of the holiday season. Make a secure credit card donation online: www.globesanta.org. You can drop off your donation at The Citi Performing Arts Center Box Office, 270 Tremont Street, Boston or at any performance of Irving Berlin's "White Christmas" at the center.